Judy Martel, CFP, offers guidance to wealthy families and their advisers on how to avoid conflicts brought on by greed, selfishness, and shortsightedness which often surface when dealing with family wealth. 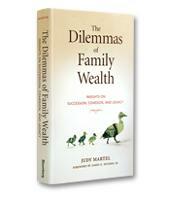 Martel gathers additional advice and perspectives from top experts in the field as well as from family members who have been successful in keeping the wealth within the family. How to let go of a business. How to keep future generations connected. How to bring up future wealth generators. How to keep the family together. How to integrate new family members. How to prepare future generations to handle wealth. How to plan an estate.